The cover art for this book looks intricate but not striking, and probably won't catch anyone's attention -- it's just a wall of green. I've seen this book many times on Amazon Japan but has always avoided buying it. I've finally decided to take a gamble buying it as a reader was asking about it. 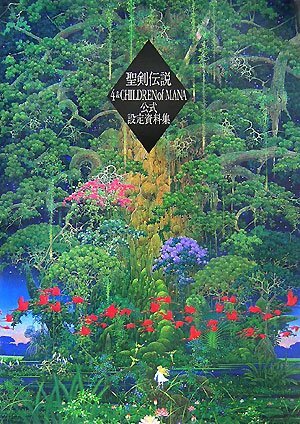 This is a 208-page hardcover art book for 聖剣伝説4 (Secret of Mana 4) and Children of Mana, the Mana video game series from Square Enix. It features designs for the characters, background, enemies, splash art and an interview. It's a fantasy genre game but the art direction has a slightly cartoon style, a style I really like. The art is really colourful and beautiful. The bulk of the illustrations are pencil drawn and painted with (looks to me like) watercolour. Many of the pencil sketches are very detailed. There are plentiful character designs with exotic costumes. My favourites are the element spirits, which are still as cute, plush toy cute. All the characters look very lively. Background art takes a smaller portion of the book. The section is loaded with background paintings, with many of the individual parts singled out, like furniture, textures, trees, stairs and basically anything that can be taken apart. These locations are basically towns, forests and castles. As with the nature of the game, their designs are stylised. If you can read Japanese, all the drawings comes with commentary. My only gripe is of the size of the images, which are gorgeous, but printed a bit small. They deserves a larger canvas. It's a very nice book. Highly recommended. Another great find and review. Thank you. I've always loved the Mana series of art. Ack, need an english version of this book stat! ...tempting me to order overseas. I know this is a bit late, but does this book name the artist that did the cover artwork of this book? I've seen that it's insinde the book as well, and I'm desperately trying to find out who did all these pointy styled artworks for SD2+3+4, because I want to find the one he made for SD3 in a high resolution. The name of artist is "Hiro Isono". Take a look for art in google images and in some art sites. Most of the pictures will be with the same theme and art style.